Across Asia and Europe, high-speed rail is providing a competitive alternative to air travel on the same routes, in terms of price and the all-important barometer of time. Put that together with the environmental benefits that flow from not burning jet fuel, and staying on the ground begins to make more sense for travelers who would otherwise trudge to the airport. Speedy trains and planes are generally competitive until your travel plans extend beyond 1,000 kilometers (621 miles), at which point travelers consider flying superior for time savings, according to an overview of academic research by the Journal of Advanced Transportation. But new technologies may push that boundary in the years and decades to come. The chart on the right gives examples of key global routes where the two are currently comparable. “Travel time is critical for the competitiveness of different transport modes,” researchers from Beijing’s Beihang University and the University of South Florida in Tampa wrote last year, buttressing a 2014 European study (PDF) that found more air service on routes for which trains take longer. While this supports the theory that trains can supplant air travel if door-to-door time and price are equal or better, that doesn’t turn out to be the case in reality. It’s not a zero-sum game after all. In general, the advent of fast, affordable train service in China, Japan, South Korea and western Europe has eroded such preconceptions as to how airlines and railroads compete. The new rail industry is seeing its most vibrant growth in China, which also has the world’s largest high-speed network, the fastest trains and the greatest ambitions for future expansion. 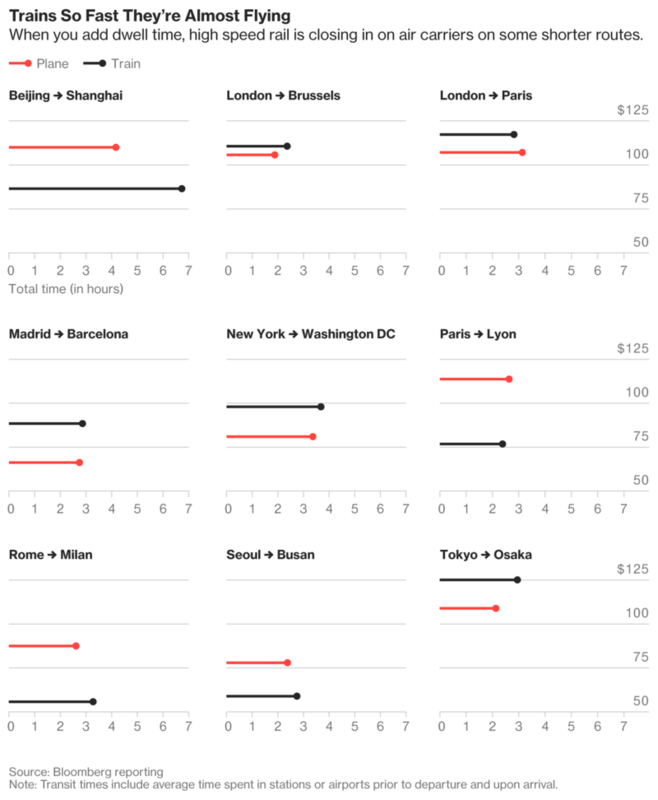 The entry of high-speed rail in markets dominated by airlines doesn’t always lead to fewer available flights—there’s evidence that, in many places, affordably priced train tickets actually spur new travel demand, much the way ultra-low-cost airlines in Asia, Europe and the Americas have affected bargain fares. That helps both trains and planes. One of the world’s busiest routes, Beijing to Shanghai, features the new domestically built Fuxing high-speed train, now with a top allowed speed of 218 miles per hour (351 kilometers per hour). That speed increase cut the 775-mile (1,247 kilometer) trip to 4 hours, 28 minutes on a route that has about 100 million rail passengers annually, according to Chinese news service Xinhua. Japan’s high-speed shinkansen, or bullet trains, date to the 1960s and have become a staple of domestic travel, with speeds of about 199 mph (320 km), making for a 2 1/2 hour trip between Tokyo and Osaka, one of the most heavily trafficked routes. That same city pairing, however, has hourly airline service by both of Japan’s largest carriers—with each using a mix of wide-body Boeing Co. 767s, 777s and 787s for the 70-minute flight. While adding station/airport dwell time and the time spent getting from city center to the platform/gate doesn’t change the result in this case, such calculations sometimes make the difference when it comes to travel time. In 2015, 910 million Chinese traveled by all forms of rail—more than twice the 415.4 million who flew, according to the journal article. Unsurprisingly, the future of train technology resides in China. The first magnetic-levitation, or maglev train, which can travel as fast as 267 mph (430 kph), operates in Shanghai; engineers are researching future maglev trains that could travel at a stunning 373 mph (600 kph), an achievement that could thoroughly upend the current dynamic between air and ground travel. Over time, Chinese airlines and high-speed trains have generally evolved so that fares and service classes are comparable, said Yu Zhang, an assistant professor of civil and environmental engineering at the University of South Florida and one of the journal report’s authors. In their early days, Chinese high-speed rail operators sought to emulate airlines in terms of attendant training, with fares that were generally too high to spur much demand, she said. Since then, train fares have dropped. In Europe, the Eurostar high-speed rail from London to Paris and Brussels served 10 million riders last year, the fourth since it first topped that mark. The service began in November 1994 and drew 2.9 million passengers the following year. Current Eurostar fares begin at 29 pounds ($39), down from initial fares of 79 pounds in the system’s early days. Again, the different modes of transport that might seem to be rivals for the same passengers are in many way complementary. Low-cost airlines focused on short-haul routes and European high-speed rail options that would seem to compete are generally not rivals, given their vast differences on other counts. The trains generally serve city centers, while the air carriers tend to use secondary airports further afield as a way to lower their costs. And what happened to the big airlines on the continent such as Air France-KLM? They have ceded traffic on the shorter routes to low-cost rivals, including Ryanair Holdings Plc and EasyJet Plc. Many major U.S. airlines are following suit, abandoning smaller regional jets and reducing service to less-populated cities. “The way airlines think of trips that are short-haul has changed,” said Holly Reed, an executive with Texas Central Partners LLC, which is raising money to build a bullet train between Dallas and Houston. By now, you may have noticed the absence of one large country from this discussion. After a century of neglect, U.S. transit infrastructure has more in common with the developing world than with China or Western Europe. While Asia rail systems measure their passengers in the hundreds of millions, in the U.S., Amtrak had 31.3 million riders in its 2016 fiscal year. America’s fastest train, the Acela, travels on the Boston-New York-Washington corridor with a speed capability of only 150 mph (241 kph)—but the trains rarely exceed 100 mph (161 kph) due to congestion—and then only for short periods on aging tracks. With the rails often running parallel with the busy Interstate 95, it’s not uncommon to see cars outpacing locomotives.